Celebrity Goat's Milk Butter is made by churning rich, 100% Canadian goat's milk into a creamy, sweet tasting butter with 80% butterfat. Celebrity butter is produced by family-owned Alliston Creamery. For over 40 years, the creamery exclusively selects milk from goat herds who graze within southern Ontario. This rich, white milk creates a pearlescent butter that, unlike competitors, goes without any colouring. For the salted variety, Celebrity adds coarse salt to give a full texture and rounded taste. 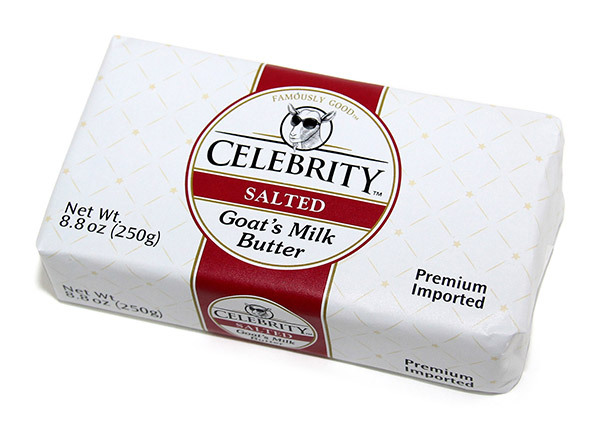 Celebrity Goat's Milk Butter has the same consistency and texture as cow's milk butter, but melts at a slightly lower temperature, making it an excellent spread. Goat Butter is ideal for cooking and spreading on toast.